"We'll give it all we've got!" Chloe is a photogenic, athletic Chinese-American woman. She dresses in the most fashionable clothes, yet makes them look effortlessly natural. Chloe's Brawn, Agility, and Accuracy are one rank lower without her armor. If one word could be used to describe Chloe Zhang, it would be "active". Nearly every moment of every day is occupied with something, whether it is research into new semiconducting polymers, competing in a snowboarding competition, acting in a film on location in Mongolia, promoting the Special Olympics, or dancing at the newest and most exciting club. Despite the frenetic pace of her lifestyle, she always seems as ease with the people around her, and she is never too busy to be gracious. She is a genuinely nice person. Adventure: The character has an adventurous spirit and rarely turns down a quest. Protection: The character wants to protect others, particularly the innocent and the helpless. Vulnerability: All of Manticore's powers are dependent on her armor and equipment. Enemy: Chloe Zhang is internationally famous, which makes her a very easy target for her enemies. Zhang Qianwei is the daughter of Zhang Ka-shing, one of the twenty richest people in the world, who emigrated to the United States from Hong Kong in 1998, and obtained American citizenship for himself and his two children. Over the course of the next few years, he moved the corporate headquarters of his company, Zhangsun Telecom (market value $170 billion, according to Forbes), to Manhattan from Hong Kong. However, the company still has extensive holdings in China, primarily in land development and telecommunications. In the rest of the world, the majority of their holdings are in telecommunications, hotels, and resorts. Qianwei was educated in the United States, where she is known as Chloe Zhang, but until recently she spent most of her school vacations in Hong Kong, where she is a bona-fide celebrity: she has been on the cover of numerous magazines (the Hong Kong edition of Cosmopolitan over a dozen times in the last ten years), appeared in several films (she is friends with John Woo and Jackie Chan, in addition to a lot of Chinese show-business types that no one in the USA has ever heard of), and has released a few pop albums which have been quite popular in Asia. She is also an avid skydiver, skier, snowboarder, and surfer. She often has lucrative endorsement deals despite her amateur status, and she spent six months on Wheaties boxes a couple of years ago, which is the first place most people in the USA saw her. Chloe donates all of the proceeds from her endorsements to charities, such as the Special Olympics. In addition to her artistic and athletic pursuits, Chloe is absolutely brilliant. She has doctorates from Stanford and Georgia Institute of Technology, and she has developed a number of breakthroughs in telecommunications. For example, she invented a nanotechnological process which permits multiple signals to transmit simultaneously on the same antenna without interference (aka MIMO, a technological underpinning of the WiMax standard). Recently, Chloe's 80-year-old father decided to retire back to Hong Kong, where her older brother runs the Asian divisions of the company, leaving her in New York to run the North American and European divisions (although she is technically Vice President In Charge Of Research And Development). Tabloids have connected Chloe to numerous handsome and/or famous men, and some of these rumours have been true, but she has no interest in marriage at this time. She has stated in interviews that she wants to be a wife and a mother -- but not yet. "I have too much still to do," she explains. "It would not be fair to a husband or a child." 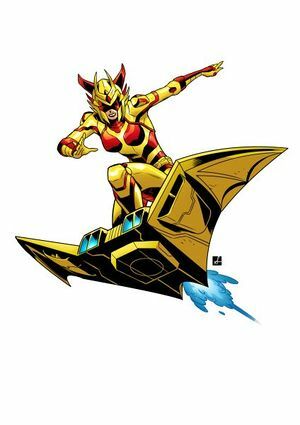 Fun fact: In China, Chloe's superhero persona is known as "Dragon's Lovely Daughter", while in Japan, she is known as "Super Demon Rider Girl". Chloe Zhang possesses superhuman cognitive ability, but her most significant posthuman ability is her extraordinary focus. She is capable of concentrating on several problems simultaneously, and even carry on a conversation while doing so. When combined with her reduced need for sleep (she rarely sleeps more than two hours per night), she is more productive in one day than an ordinary person would be in a month. Her most flamboyant abilities are granted by the Manticore armor and jet wing, both of which are her original designs. The armor enhances her speed and reflexes, it provides defense against all but the most powerful conventional weaponry, and it houses a wide array of sensory equipment. In addition to its use as transportation, Manticore's jet wing is a flying weapon platform. The jet wing has machine guns and a selection of special purpose mini-rockets, as well as a net cannon and a grappling line. This page was last modified on 5 December 2014, at 09:40.